Eastbourne Rovers came home from the Sussex County Track and Field Championships with the best medal haul for many years. The team brought home 17 gold, 17 silver and five bronze as well as two championship best performances and many personal bests. Moyo Sargent took a hat-trick of golds as he dominated the 100m, 200m, and 400m sprints for under-17 boys. His most impressive run was in the 400m when he knocked the long standing record of 49.97 down to 49.02. 11.44 in the 100m and 22.7 in the 200m gave him times many senior athletes would be proud to perform. This 400m time puts him third in the country for his age group. The other Championship Best Performance came from Bailey Wright in the under-20 100m. The record of 10.9 had stood since 1978 and so Bailey’s 10.72 is going to be difficult to beat. Bailey took the sprint double beating all the senior times, when he also took the 200m title in 22.02 secs. His 100m time places him sixth in the country. Chris Dodd continues to dominate the senior men’s middle distance as he took gold in the 800m (1m56.79) and 1500m(4m06.61). Bradley Eisnor had a busy two days, winning gold in the long jump with a leap of 6m28 and threw 46m09 for gold in the javelin. He then took silver in the 100m and bronze in the discus. Shania Martlew found her speed in the under-17 100m, as she surged through the finish line for a personal best and gold medal in 12.7secs. She had to settle for bronze in the 200m but with a personal best of 26.4. Russell Weir is pole vaulting consistently well and cleared 3m60 to take another gold. The last of the gold medals came when the under-20 boys lined up in the senior men’s 4x100m relay. Bailey joined Bryn smith, Liam Hennessey and Mason Dowle and with some slick change- overs, broke the club record for this event. Bryn was hot on the heels of Bailey in both the 100m and 200m. It was good to see the Eastbourne vests taking the first two spots. Bryn’s time of 11.02 was a personal best and a qualifying standard for the English Schools Competition, placing him third in the South East. Pyers Lockwood is challenging himself in the 400m hurdles this season and is off to a good start clocking 60.27 for a silver medal. He added two bronze medals in the 400m and 100m in 51.57 and 11.78 respectively. Molly Swingler put her speed and stamina training together for well-deserved silver medals in the 200m (26.5) and 300m (42.12) – both personal bests. This was matched by training partner Rose Chaplin who ran a very well paced 800m to record a personal best of 2m20.58 for second place, beating several girls who had run faster in previous competitions. Liam Hennessey is a talented all round athlete who concentrated on the long jump, leaping 5m72 to take silver. Harriet Armstrong ran a brilliant personal best in the under-15 100m of 12.8 to clinch the second spot. Eastbourne are starting to produce some good 400m hurdlers as Stevie Kasparis and Craig Razzel both picked up silver medals in the under-20 and senior events. Kai Fletcher has been steadily finding his old form and was thrilled with his silver in 50.95 and a PB. 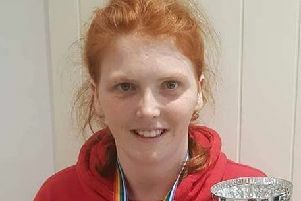 Nellie Hannam threw 26m70 for a silver in the under-17 discus. The weekend finished with a fine run from the under-17 girls. Shania and Molly linked up with Macy Ring and Esme Campbell to run a fast 4x100m, taking the runners up spot to Crawley. The under-17 girls 200m final looked like the Eastbourne club championships as down the straight came Molly for silver, Shania third, Mia O’Hara fourth, Macy Ring sixth and Esme Campbell- Marshall eighth. The junior athletes now look forward to the Sussex Schools Championships in June.